Renunciation is about more than just doing without things. It’s the beautiful realization that you already have everything you need. Forum participants: Ajahn Amaro, Geoffrey Shugen Arnold, and Elizabeth Mattis-Namgyel. Introduction by Koun Franz. My first attempt at Buddhist practice was an act of renunciation. I had been reading whatever Buddhist books I could find at my high school library, and though most of them made no sense to me, one teaching from the Vinaya stood out for both its repetition and clarity: Do not sleep on a high bed. It kept coming up. So I started sleeping on the floor. I had no idea why, but it seemed important. One cold night ten years later, I left my wife behind to enter a monastery deep in the mountains of Japan. I had only my robes, my bowls, and the certainty that this, too, was important. I had not transcended attachment, not by any means—we hugged before I left, and as we did, I thought, I don’t know how to let go. I needed to learn how to let go. So, said the Buddha, do we all. The topic of this issue’s forum, renunciation, does not lend itself to easy answers. For some, the word evokes basic questions about how much we need versus how much we want, what is ours to give and what holds us back from doing so, and specifically, as Buddhists, the relationship between our investment in practice and what we get in return. For others, an act of renunciation can look like just another attachment, a story people tell themselves about how spiritual they are. To really let go, they say, you also have to let go of letting go. Renunciation can be submission to a schedule that is not of your own making; it can be the offering of all things to all beings; it can be the act of embracing things just as they are. Renunciation can be a radical intuitive leap beyond all preferences. And it can also be the choice to sleep on the floor even when you really prefer to sleep on a bed. However we define the term, we cannot avoid it. The Buddha’s story—our story— starts not under the Bodhi tree but years before in a palace, with the young prince Siddhartha tiptoeing past his sleeping wife and newborn son, through the gates, and into the darkness, vanishing into poverty and solitude. We call this choice, this midnight escape, the Great Renunciation. But why? Is it great because of what he left behind, or because we are unsure if we could do the same? How do we know unless we try? The fact is, we do try. In small ways and large, we enact and reenact Siddhartha’s departure—and his stealth. This morning while most people were still sleeping, lovers slipped quietly away to meditate with a sangha across town. Mothers and fathers snuck nimbly down hallways and around toys to do prostrations in the kitchen. Workers set off in buses to retreats far away, spending their hard-earned wages to do so. In these ways and many more, we become intimately familiar with our palace walls, knocking them down, rearranging them, jumping over them, coming back, starting over. In the conversation that follows, our panelists—three teachers from three different traditions—examine the role of renunciation in our life and in our practice. They encourage us to discover what lies on the other side of the walls we’ve built, beyond mine and yours. Buddhadharma: We want to explore the role of renunciation in Buddhist practice and what it means for modern-day practitioners, but to put it in context, perhaps we could start by looking at how renunciation has been understood historically. 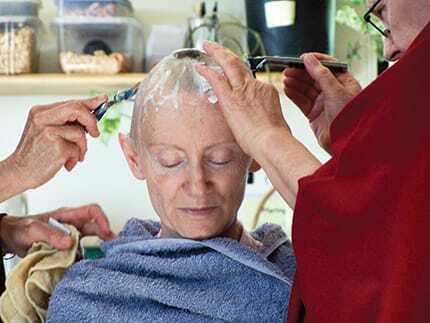 Ajahn Amaro: Well, in the Theravada tradition, as in the Buddha’s own sangha, the monastic order follows the Vinaya, training rules based on the way of life of the wandering yogis of India. The basic mode of life for any kind of yogi in the Buddha’s era was a renunciant one—living without an abundance of personal possessions, having only the robes that you’re wearing, not using money, and being celibate. In a Theravada country, that same model of simplicity and renunciant way of life is still upheld today, though to varying degrees of refinement. In most Theravada countries, there’s a tradition whereby the lay community, either on the full moon of each month or on the four lunar quarters, adopts a simplified renunciant form for the day and takes up the precepts to refrain from killing, stealing, sexual activity, false speech, and using intoxicants. They would also take on the precept of refraining from eating in the afternoon or the evening, wearing decorative clothing, seeking amusement, using any kind of distractions, or lying on a high or luxurious sleeping place. Elizabeth Mattis-Namgyel: In the Mahayana, the emphasis is on motivation. Renunciation has to do with moving out of a contracted sense of self, the ego; we use our relationship with others to do that, renouncing self-care and moving more toward serving others. In the Vajrayana, renunciation has much more to do with what’s happening inwardly, with letting go of grasping and rejection. Geoffrey Shugen Arnold: The term “renunciation” does not appear very much in Zen teachings and literature. But within the monastic tradition, of course, it is a part of daily life, much as it is in the Tibetan and Theravada traditions. In the Mahayana teachings, there is a shift or expansion from giving up or renouncing certain things to recognizing that those things in and of themselves are dharmas; they are empty and have no “self-power,” and therefore are not in fact hindrances. So one would renounce renunciation, knowing that there is ultimately nothing that needs to be renounced because nothing is inherently obstructive. And yet this understanding is coming out of the lived experience of what we might call “practical renunciation”—working and living within a material world, with a material body and the desires that arise. Buddhadharma: How do you think the teachings on renunciation are holding up in the modern world? Geoffrey Shugen Arnold: They are under siege. I recently participated in a conversation among Zen teachers about lay and monastic practice, and the question arose of whether laypeople can experience renunciation in the same way that monastics can. Lay teachers were saying, “Of course we renounce—we don’t get everything we want. We have to give up or give in to things all the time.” With so much of my training years spent in the monastery, my experience of renunciation was not just that of living a simple life, but on a much more personal level, of having the self stolen away. I had to renounce those cherished parts of myself that I was clinging to, which is a very difficult thing to do on one’s own. Of course I can renounce things on my own initiative, but I find it’s a different experience when the teacher demands that I give something up. There is a keen sense of renunciation and struggle that ensues, and the nature of that release and expansion into nongrasping, the giving up of something cherished that is precipitated by the teacher or something outside of oneself, holds an incredible capacity for liberation. Ajahn Amaro: I would agree that renunciation as a principle is somewhat under siege. Culturally there is an ever-increasing surge toward getting more, having better, upgrading, which is intrinsically seen as a good thing, so renunciation doesn’t really get a nose in the door. There’s not much encouragement toward simplicity—although I noticed a few weeks ago that for eight-hundred-plus dollars a night, a high-end hotel was marketing itself as a haven with no Internet access and no cell phone coverage! So there is a sense that renunciation has been lost culturally. And yet on the spiritual level, a basic hunger for simplicity remains. We might not think of retreats as a renunciation program, but when people do a silent retreat for a week or ten days, there’s an appreciation among retreatants that what they’re doing—not speaking to other people, following a routine, sitting together with others and not constantly wiggling around on a cushion, learning to deal with discomfort for extended periods—is in fact powerful. The complexity, busyness, and agitation of the culture at large increases the longing for that kind of simplicity. Buddhadharma: Are Western practitioners willing and able to embrace renunciation as an important aspect of Buddhist practice? Elizabeth Mattis-Namgyel: I think Americans in particular have a lot of trouble with the idea of renunciation, with the notion of somebody taking away their freedom. We don’t like to give up freedom. But in the Tibetan tradition, it is said that the mind is like a limbless person sitting on a wild horse. We can’t rein it in when we don’t have arms. So we need some forms; we need the vows and precepts, which give us the support to live within the boundaries of our intention. And they create choice, actually, because when you’re a limbless person sitting on a crazy horse, you don’t have much choice. Sometimes the language of the vows and precepts may seem outdated or like they don’t make a lot of sense, but in my tradition I have always felt encouraged to investigate what will serve in any given situation. I can’t imagine living without that infrastructure—it’s what we need to live a sane life. Buddhadharma: Is renunciation a tough sell, though? When you’re working with your students and speaking to people in different communities, do you find that renunciation is something people resist? to react to someone who evokes anger in you. Renunciation doesn’t take away choice; it creates choice. It creates freedom, because we’re not just reacting habitually. People understand that aspect very well. I think many of the issues around the “tough sell” of renunciation are largely due to a language problem. I was reading Rose Taylor Goldfield’s new book, Training the Wisdom Body, in which she discusses renunciation as emergence. What are we emerging from? From a very confused state in which we don’t know how to bring our actions together with our intentions, a place where we react out of ignorance and create a lot of trouble for ourselves. So I think renunciation is the foundation of everything. It needs to be more deeply explored. Ajahn Amaro: Yes, in English the word “renunciation” has the connotation of gritting one’s teeth and bearing a diminished situation for some sort of spiritual good. It’s going without something that you would really prefer to have. But within Buddhist practice, the quality of renunciation, or nekkhamma as it’s called in Pali, doesn’t have that sense of diminution; it has a whole different tone. The word bramacharya, which can be used as a synonym for the renunciant life and also for celibacy, literally means “divine conduct” or “walking with the gods.” So rather than going without, one is actually choosing to walk with the divine instead of being caught up in ordinary worldly preoccupation. Buddhadharma: How does one move from an ordinary view of renunciation to one that embraces this notion of walking with the divine? Geoffrey Shugen Arnold: I think there has to be a leap of faith with renunciation, a willingness to give up something that we still want to hold on to, that still holds a promise of satisfaction. We can begin by practicing with renunciation in an externalized way. That’s what the structure of a retreat does in the beginning—it gives us a schedule and parameters, precautions and precepts. We may feel an affinity with these or we may resist them, but still, there’s a sense of these coming from the outside. Then as we practice and see how they begin to have a positive effect, those parameters become more internalized. The process of giving up becomes more natural; it comes from our own sense that we are on a good and fruitful path. We also begin to recognize the mechanism of subject and object—of the one who desires and the objects of desire—that ultimately needs to be transcended. We discover that objects are not the problem; our thoughts are not the problem; there isn’t a problem. That process of renunciation, which began on the outside and moved inside, is now seen as expansive, as the natural order of things. Buddhadharma: Is there sometimes a danger in perceiving renunciation as a state of mind rather than as a commitment to giving something up or making some kind of sacrifice? You know, the idea that it’s okay to have a Cadillac so long as you’re not attached to it? Can it be a slippery slope? We can tell ourselves the story that we’re not attached, but often we’re deceiving ourselves. Buddhadharma: When we take up a formal Buddhist practice, it often involves a real time commitment that separates us from our families or jobs. How do we make sense of that compromise, both in terms of what we’re giving up and what we might be denying others? Ajahn Amaro: What immediately comes to mind is the comparison to athletic training. The word “asceticism” comes from the Greek term askesis, which originally referred to training athletes. If you want to win the race, you’ve got to train; you’ve got to look at your exercise regime. You’ve got to look at your diet and your sleep and conduct, because if you don’t, you’re not going to win the race. So the asceticism that an athlete undertakes depends upon putting some other things aside. If you want to be a doctor, you’ve got to go through the mill of medical training, working a hundred hours or more a week as a junior doctor, being tested in grueling conditions so you can become a healer. That enormous degree of renunciation, which involves laying aside other interests and concerns, is completely accepted by society. If we aspire to the spiritual version of that same kind of training in order to realize our potential, we have to prioritize the way we spend our time and where we put our energy. Elizabeth Mattis-Namgyel: This question really comes from the fact that in our culture, we don’t appreciate spiritual awakening in the same way that we do the accomplishments of a doctor or an athlete. In India or Thailand that goal would be highly respected, but here we don’t place much value on emerging from ignorance. In my community there’s a lot of emphasis on retreat, and it’s a very family-oriented community, so we’ve found ways to support each other. In a family where the wife plans to go into retreat for one hundred days, the husband will watch the children, but the whole community will also be involved in helping. Sometimes, of course, it might be completely inappropriate for somebody to leave their child; it depends on the situation. But if someone is really on fire to wake up, they find a way to practice. Geoffrey Shugen Arnold: In our community, I counsel students to nurture bodhicitta and that sense of urgency for practice, but not at the expense of their families. Over time, they have to work out the balance of forsaking neither family nor practice. But I think it’s also important to think beyond this duality and compartmentalization. When we can truly see our traditional practice, our family, and our work as one seamless whole, then each aspect of our life informs and deepens all other aspects. It’s important to experience these things as integrated and mutually supportive, nourishing, and enlivening. Buddhadharma: The Buddha, after exploring the depths of both decadence and self-denial, arrived at the Middle Way. Is renunciation a prerequisite for understanding where the middle really is? My teacher often uses the phrase “little needs, much contentment.” If we have few needs and much contentment, we experience the wealth of the world around us, and when we experience that wealth, there’s nothing we need to renounce and nothing we need to add to it. Geoffrey Shugen Arnold: I agree that renunciation is key; there’s no practice without letting go because we are so used to grasping. Monastics, whether Theravada or Mahayana, are working within clear monastic guidelines for renunciation. For lay students, the path is a much wider field because people are making their own decisions. In this respect, I think of oryoki, the bowls used during formal meal practice. Oryoki means “the vessel that contains the right amount.” How much you need to nourish yourself is up to the individual, and yet it has to fit within that physical bowl. We still work within parameters in finding balance. Ajahn Amaro: The practices of renunciation are tools for spiritual exploration. By voluntarily entering into the training, by asking to be taught, you’re choosing to look at your areas of attachment. Where does the mind cling? Through renunciation—in terms of the way you live, the things you do, the things you don’t do—you can face the areas where you’re stuck and discover the things that you like, the things you dislike, and the things that you believe you have to have in order to feel good and happy. Renunciation practice provides a lens that can be held up to those areas where we find limitations and attachments, and by being able to see them, we can let go. The most dangerous attachments are the ones we haven’t got a clue are there. Along with the standard monastic rules, there are additional ascetic practices that the Buddha offered as a sort of raising the stakes to make things even simpler or more demanding. We can take those on as well. Those are practices that really challenge things such as sleep, food, shelter, clothing, and radically simplify these basic elements of living. The purpose is not to torture yourself or prove to other people how tough you are but to help meet your areas of deep clinging and thereby let go of them, liberating your heart in a more complete and comprehensive way. 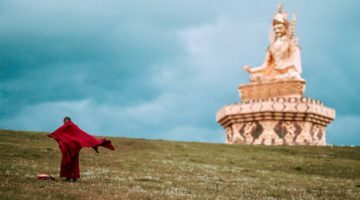 Buddhadharma: What advice do you have for practitioners who have not embraced a practice of renunciation but are inspired by this conversation to explore it? Where can they begin? Geoffrey Shugen Arnold: I’d say simply start a meditation practice, because that brings you right to renunciation. You could also look at any aspect of your life in which you feel there is indulgence or harmful excess—or deprivation, for that matter. Renunciation sometimes means renouncing our notions of spirituality or asceticism or deprivation, too. We can have false ideas that we’re somehow more spiritual if we are creating material suffering for ourselves, so it’s very important to look at the mind of grasping and start there. Ajahn Amaro: The phrase that springs to mind is “Switch off your cell phone.” Just park the phone and switch off the computer for one day a week and have what they call a “data sabbath.” Leave yourself unconnected for a day, once a week or once a month—grant yourself some sanctuary and silence, which is so hard to find nowadays. Solitude is almost a dirty word these days, but it can be a real gift. Allow yourself to actually be present, to feel the earth under your feet, to feel your breath and the world that you’re in rather than being in a constant state of electronic communication with others. A deliberate taking up of a simplification practice is making a choice to go against the currents of your habits. Choose the areas where there is the deepest entanglement and think creatively. Explore ways that you can put aside or diminish the focus on that obsession, then carefully and attentively watch the results of that relinquishment. Elizabeth Mattis-Namgyel: I was thinking of a quotation from Paltrul Rinpoche in The Words of My Perfect Teacher, where he says, “If you have a horse, you have a horse’s worth of problems. If you have a bag of tea, you have a bag of tea’s worth of problems.” If you say that to anyone, anywhere—if you go into a bar and say that—people will laugh and know exactly what you’re saying, because everybody is struggling with what they have and what they want, with what they can’t get, and the burden of just having and needing. I do have a horse and a horse’s worth of problems, actually, and sometimes I wonder, is this attachment? Or am I just putting myself in a situation where I’m loving and can extend care toward another being? How do we make those discernments? As Tilopa said to Naropa—these are the two great siddhas in our tradition—it’s not the material, outer things that bind you. It’s all your wanting and not-wanting (shenpa in Tibetan). Start with your shenpa—your preferences and grasping and rejecting. That’s really what binds you. Buddhadharma: As Buddhist practitioners, are there things we must give up in order to deepen our spiritual practice? Or can we have it all? Geoffrey Shugen Arnold: I think the answer to the question “Can we have it all?” is “Yes, but it’s not what we think.” As is said so many different ways in the Buddhadharma, in order to discover the wealth of the treasury of the true dharma eye, we have to experience the absolute loss of everything—inside, outside, nose, tongue, body, mind—in other words, the deep, direct experience that was the Buddha’s enlightenment and that is the lifeblood of Buddhism. Times change. Language, culture—all of that changes. But this basic truth, which has been understood across many religious traditions, doesn’t change. I think our current time is a huge and rather dangerous experiment in not living in accord with our spiritual nature. One possible outcome of the current path is our own demise, and the other is a much larger awakening—realizing the fruitlessness of the self-inflicted wounds we’re creating, not just materially but on a deep spiritual level. Our time-honored spiritual truths and practices are still demonstrating an alternate path to chaos. Elizabeth Mattis-Namgyel: Members of our sangha used to go to India every year and make offerings. We have a dana program; we make offerings in all kinds of interesting and creative ways. Sometimes, for his teachings, people offer jewels to Rinpoche, so he collects them and keeps them in big bags. One of the offerings he made was in Bodhgaya. As we were circumambulating around the Mahabodhi Stupa, Rinpoche put his hand into the bag and picked up handfuls of jewels, throwing them in the air. There were so many different reactions: the beggars were picking up the jewels; some onlookers were really disgusted. That moment affected me very deeply—it was such a deep expression both of renunciation and of feeling the richness of the world. I felt so wealthy in that moment, as my teacher was throwing those jewels up into the sky. That scene encapsulates the feeling of renunciation for me. Ajahn Amaro: The “Can we have it all?” question, to me, hinges on the attitude that we have toward “all” and also toward “having.” There’s a mysterious chemistry that happens: when you let go of everything, then everything belongs to you. There’s a passage in the Sutta Nipata where the Buddha says that the wise see that nothing belongs to them, and nothing doesn’t belong to them, either. When there is a real letting go, the heart of nonattachment is completely attuned to the world and yet is not entangled in it. When renunciation is truly enacted, there’s a beautiful sense in which everything is yours. Renunciation is actually like the experience of punna, of fullness. There is an infinite fullness of being, a completeness that only comes with arhatship. On the outside it looks to the world like you’re doing without a lot of things, but inside you’ve got everything. Elizabeth Mattis-Namgyel is a Vajrayana teacher and retreat master with Mangala Shri Bhuti, based in Crestone, Colorado. She is the author of The Power of an Open Question. Geoffrey Shugen Arnold is the abbot and resident teacher of Zen Mountain Monastery and abbot of the Zen Center of New York City. He received dharma transmission from John Daido Loori Roshi in 1997.